The Bar Tag Charm is a simple elongated charm and the name is stamped vertically going down the charm. It's the perfect addition to your mother's necklace or charm bracelet. 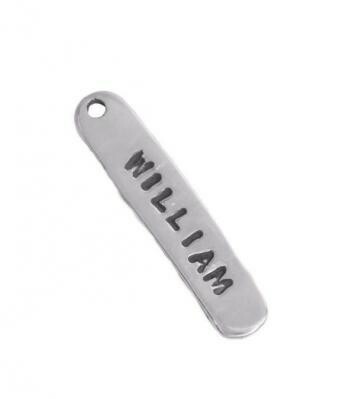 The stamped Bar Tag Charm is a simple way to add a first or last name ot any charm necklace or charm bracelet. This sterling silver charm can be stamped with up to 10 characters. Up to 10 characters can be stamped on this charm in our Lizzy font. The charm is approximately 1" x .25". Thanks for helping add both our girls' names to the bracelet and their birthdate!